Innovative methods to better recover the waste is increasing. Near Portland, United States, the treatment plant in Durham has been launched in the manufacture of fertilizer ready from wastewater from 500,000 homes. Specific treatment, intellectual property of the University of British Columbia under license from the young start-up Canadian Ostara, recovers in fact 90% of phosphates in the effluent. Essential ingredients of fertilizer, these minerals are then sold to various users, including farmers and nurseries. The plant produces about 500 kg of fertilizer per day. 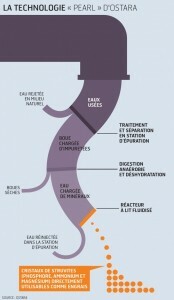 “Most sewage treatment plants are now seeking to maximize the value of their products,” explains Dominique Patureau, director of research at the Laboratory of Environmental Biotechnology of INRA (National Institute of Agricultural Research). Thus, the idea of ​​using sewage sludge as fertilizer is not new. The dry matter – which remains once the water contained in sludge removed-containing nitrogen, phosphorus and magnesium in particular, as many nutrients for use in agriculture. “It also contains heavy metals, persistent organic pollutants and other pathogens,” says Christian Mougin, research director at INRA. Result, these muds are now allowed in the fields after treatment, and only on certain soil types. However, fertilizer manufactured in Durham is freed from such constraints. “The final product is substantially pure,” says Phillip Abrary, president of Ostara. Its manufacturing principle is as follows. The wastewater coming first in a pool where bacteria will digest the impurities they turn into sludge. After filtration, the dry sludge is retrieved. The remaining water, in turn, passes through a fluidized bed reactor that is a big bowl-shaped cone. Its role is to promote the precipitation of minerals in the wastewater. This leads to the reactor the formation of struvite crystals, a mineral composed exclusively of phosphorus, ammonium and magnesium. Once recovered, these granules are dried, packaged and marketed under the name Crystal Green fertilizer certified in the United States. This technology is particularly suited to processing facilities that use biological phosphorus removal and anaerobic sludge digestion. By recovering the bulk of phosphate and 40% of the ammonia in the effluent, in fact it avoids the accumulation of struvite formed naturally in the sewage pipes of these stations and interferes with their operation. Hence a reduction in operating costs estimated by Ostara, between 500,000 and 1 million dollars per year depending on the size of the station. Another advantage, the fertilizer diffuses slowly into the soil, thus limiting the risk of groundwater pollution while providing better nutrition of the plant. Finally, the sale of Crystal Green provides a source of additional income to processing plants, whose return on investment is valued at five years. To date, three copies of this reactor, named “Pearl”, work in the United States and two others are expected to be commissioned in 2011. As the first European customer, it will be the city of London. Associated with group Veolia Environment last year, Ostara does not stop there. “We have already seen commercial success, but we Veolia opens doors to new markets in the wastewater that we could not only claim,” said Phillip Abrary. The stakes are high, especially since, according to forecasts, the phosphate could begin to fail by the end of the century.